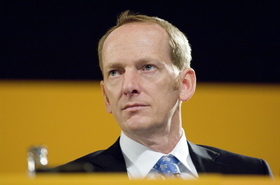 Analysts fear the loss of top people such as Karl-Thomas Neumann will make it harder for Conti to compete with Bosch. FRANKFURT (Reuters) -- Minority investors in Continental AG face an uneasy future as Schaeffler Group's stranglehold on the German auto parts group threatens a damaging exodus of talent, lost contracts and a fire sale of assets. Just when the industry faces key challenges in the race to develop technology that can usher in a new age of green mobility, Continental cannot afford to lose the fight for the best minds and Schaeffler's ouster of the company's CEO on Wednesday has the market worried. "Conti is experiencing a major brain drain right now -- probably the single biggest long-term threat to the company. Part of what makes it great is the talent of its managers and engineers," said Morgan Stanley auto analyst Adam Jonas. "The longer this situation continues, the more Conti runs the risk of withering on the vine in terms of lost business, lost people and losing its technological lead, at probably the most critical time in the industry's history since Carl Benz invented the modern car over 100 years ago," he added. BMW AG recently awarded a a prestigious contract to supply it with lithium-ion battery cells to a joint venture involving Conti's closest competitor, Robert Bosch GmbH. Continental's shares tumbled as much as 20 percent from already depressed levels after news at the end of July that Schaeffler plotted to fire Continental CEO Karl-Thomas Neumann in a boardroom coup, plunging the company back into chaos. Schaeffler controls 90 percent of Continental stock. Neumann belonged to a quartet of top executives who had transformed the tire maker into a company with the powertrain, electronics, telematics and battery expertise to challenge Bosch, the world's largest supplier based on sales. Neumann's removal at last Wednesday's supervisory board meeting means four top executives have left their posts in the past 12 months after clashes with Schaeffler, which installed the head of its own automotive business as CEO. "Continental has done a great job and their second-quarter figures were excellent. But the uncertainties are too great and a complete lack of clarity over its direction means that we would sell the stock right now," Metzler Bank's Juergen Pieper said this week. Despite its expertise in infotainment, safety and advanced powertrain technology, Conti shares trade on a multiple of just 0.7 times in terms of enterprise value to sales -- lower than the 0.8 sector average, according to Thomson Reuters StarMine. Analysts warn Schaeffler may give up integration efforts and start a fire sale of Continental assets to pay back billions in liabilities accumulated from its debt-financed acquisition, while the management drain puts Continental at risk of losing even more ground to Robert Bosch. "A Conti employee will have difficulty accepting a colleague at Schaeffler because of the feud and vice-versa. They will likely work against each other for years, which no doubt will not contribute to the company's value," said Bankhaus Lampe analyst Marc Gabriel. "With banks breathing down their necks, Schaeffler may want to get some financial leeway by disposing of everything that they can get money for, knowing that the collaboration has been a failure anyway," the automotive supplier specialist said. Even if Continental were to be broken up and sold off, assets would not likely fetch the 10 billion euros needed to pay off its net debt. A disposal of Continental's money-making Rubber Group could also trigger a credit event for debt holders, according to ING credit strategist Jeroen van den Broek. Five-year credit default swaps for Continental trade at around 800 basis points, meaning it costs about 800,000 euros ($1.1 million) annually to protect against an exposure of 10 million euros. "Given its normal credit metrics and peer group comparisons, CDS spreads would be trading at roughly half that level were it not for Schaeffler," van den Broek said, adding spreads could widen 200 points if plans for a capital hike are dropped. While Bosch enjoys one of the highest ratings in the auto industry with AA-, credit rating agencies have downgraded Conti to junk status and warned debtholders of the risks posed by Schaeffler and the 6 billion euro hole in its balance sheet. Billed as a win-win scenario for employees, customers and shareholders, proponents of the Schaeffler takeover had claimed Continental's future could better be secured by replacing the capricious interests of Anglo-American investors with those of reliable German family owners in it for the long run. Yet instead of trying to duplicate the success of Bosch, which practices a brand of socially responsible capitalism, the main winners in the case of Conti and Schaeffler are M&A advisors. "The two companies are condemned to work it out between each other. That is their lot now -- we cannot turn back time," said a source close to Continental's boardroom labor delegates. Continental ranks No. 3 on the Automotive News Europe list of the top 100 global suppliers, with sales to automakers of $25.0 billion in 2008. Bosch is No. 1 on the list with sales to automakers of $33.9 billion in 2008.